Here is the sight that greeted us outside the windows when we got up yesterday morning. That foot of snow on top of the car was not there the evening before. In the afternoon, after finishing with work, I attempted to go for a walk in the woods and learned that even with snowshoes it’s exhausting to break trail in eighteen inches of fresh fluffy snow. As of right now (I am writing this Wednesday evening) my car is still buried. I can’t remember the last time I was literally snowed in! Also, incidentally – today, March 1, is the two-year anniversary of my first blog post. Happy blogiversary to me! I’ve added up my winter season snowfall count and it was 8 days of snow seen falling and only 3 days of snow lying. These figures are pretty pathetic, even by UK standards. 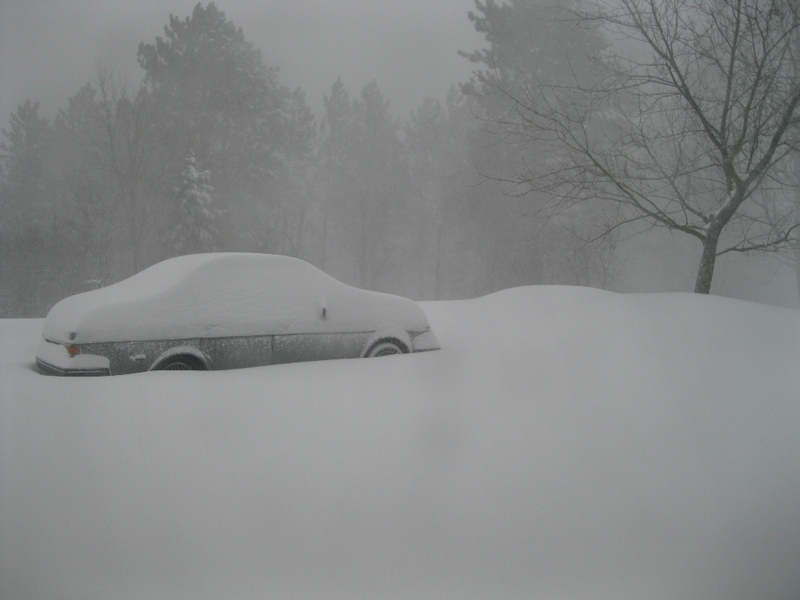 Ah, the photo of the car reminds me to enjoy my southern winters. I miss the snow, but not when digging out the car. I have very un-fond memories of hoisting a pushbroom overhead to get down to the 1/2 inch of rough ice underneath! I love the bark photo, too. I tend to go for macro photos like that. Here in Kansas City, we’ve had rain, hail, tornado warnings, sunny 70’s and snow…all in 48 hours. 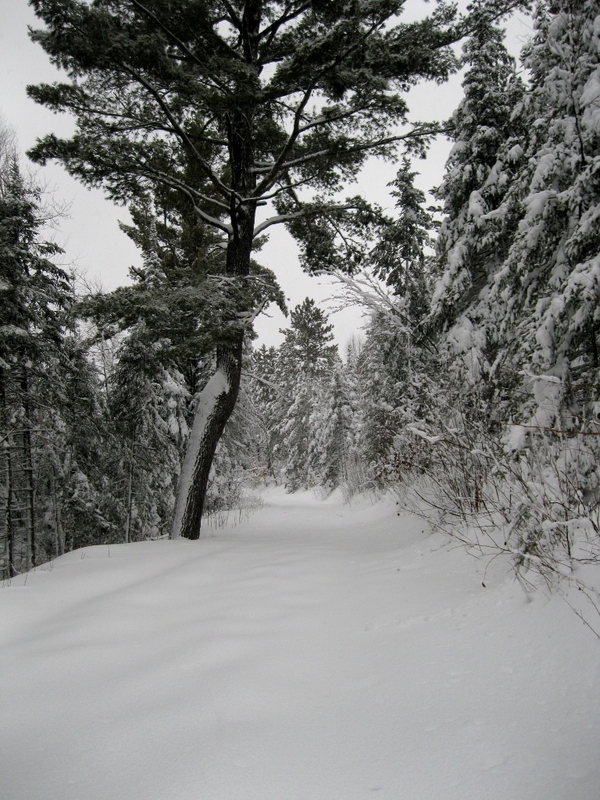 This is the kind of snow where long trail snowshoes are needed. The little plastic ones work fine on a packed trail but you found out why they make the long ones. Good way to find out about new muscle groups :) That snow looks beautiful. 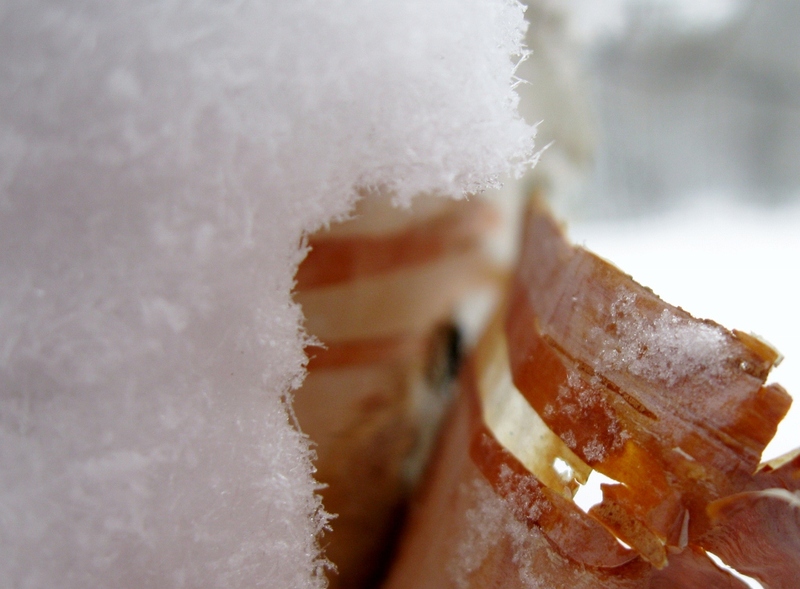 The picture of the birch bark is beautiful!